British Lionhearts claimed their third consecutive win in the World Series of Boxing, thrashing Mexico Guerreros 5-0 in London. 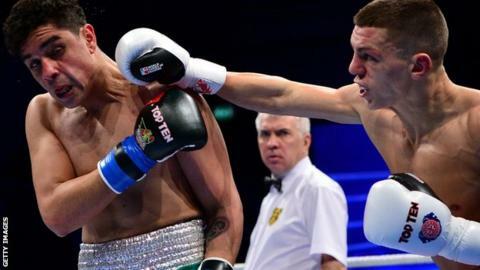 Light-flyweight Galal Yafai and heavyweight Lawrence Okolie claimed stoppage wins, while bantamweight Qais Ashfaq, light-welterweight Pat McCormack and heavyweight Antony Fowler won on points. The victory consolidates the British team's lead at the top of Group B. They have also beaten USA and Morocco. The Lionhearts next face a second meeting with the USA Knockouts in London on 3 March. The World Series of Boxing also serves as a route to Rio 2016, with British fighters who represent the Lionhearts eligible for selection for an Olympic qualifying event in May.